you are here : home > vehicle & technology > Phuket Inter Wood Work Co., Ltd.
overview of Phuket Inter Wood Work Co., Ltd.
Phuket Inter Wood Work wishes you to touch our professional in wood work for boat. We provide the highest quality standard workmanship by our team specialists. 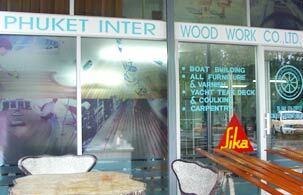 Phuket Inter Wood Work offers boat terrace through the floor, wooden furniture for boat and sets as your style. Phuket Inter Wood Work where you can fulfill the finest wood work for your boat. It’s not only our unique designs but also you will feel the difference, all our commitments are to provide the ultimate carpentry work that meets your satisfaction and to serve your needs. photo gallery of Phuket Inter Wood Work Co., Ltd.
map & location of Phuket Inter Wood Work Co., Ltd.